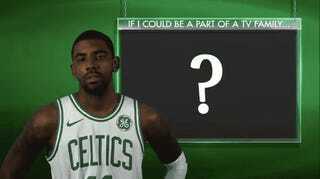 The Celtics ran one of those cute commercial-break videos at their game tonight where players answer innocuous questions about their pop culture faves. Naturally, it served as another opportunity for Kyrie Irving to show off that he is way cooler than everyone else. Irving’s not the only Celtic who struggled with the concept. I also have no idea what the hell Aron Baynes means when he just says “Vikings.” And for the record, the correct answer is the new “One Day At A Time” reboot.